Needless to say, a lot of thought and research go into where I go, and what and where I eat when I travel so as to avoid all the hidden fish sauce and shrimp paste lurking in the food in a lot of Asian countries. And it’s completely worthwhile; I’m a big foodie and eating out and discovering new dishes is one of the things I enjoy the most about traveling. And with all the research comes fantastic discoveries and experiments, but you really have to be adventurous. But unfortunately, although the vegan food scene is alive and well in several South East Asian cities, price-wise, it is often a fair few notches above your usual street food fare and this can make a big dent in a backpacker budget. Been to Koh Phangan or Ubud as a vegan? You probably know what I mean. I came up with the crazy idea to buy a small blender I could travel with a few months ago and never looked back. It’s been fantastic both on my wallet and on my health. 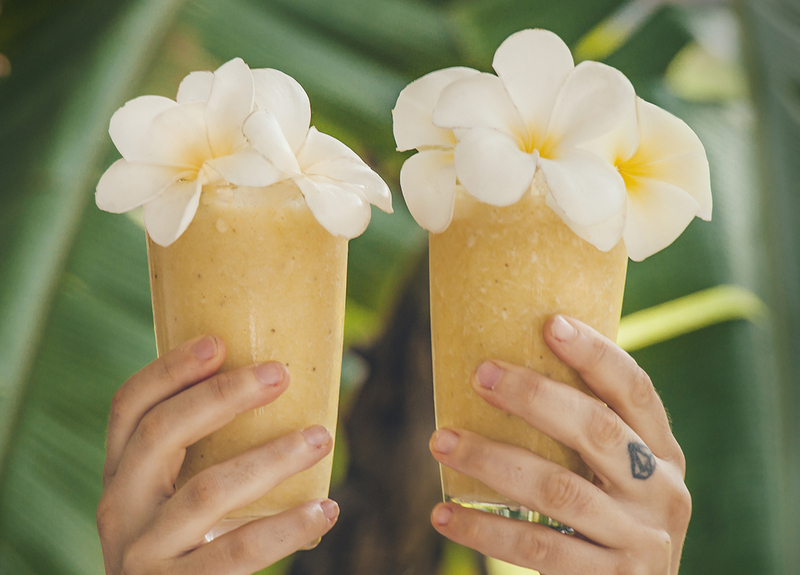 The best thing in Southeast Asia is the bounty of exotic fruits everywhere – you will see fruit shakes and smoothies for sale for pennies at every street corner. What you don’t see however is that these drinks are often laced with sweet condensed milk, a lot of sugar, and, usually, very little fruit. Making my own smoothies means I can have complete control over what goes and doesn’t go into my morning (or lunch, or dinner…) smoothie, and I can make it a million times healthier by adding extra fruit, my favourite greens and some superfoods, like my current favorites, chia seeds, maca powder and spirulina. I have saved so much money doing this and make smoothies the way I like them – with tons of fruits and vegetables! magic bullet ! Here are some blender options that are affordable, lightweight and powerful. The best part is that I can also make some delicious raw vegan savory cold soups for lunch and dinner whenever the fancy takes me. 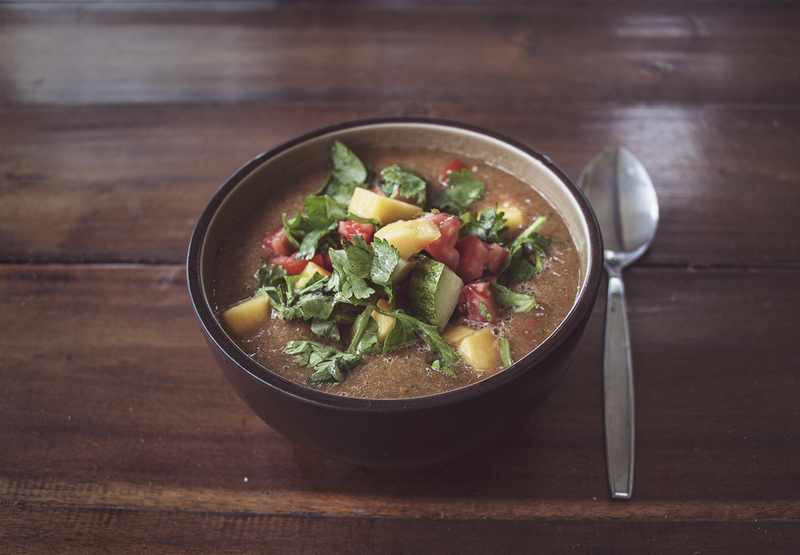 Here is my favorite gazpacho recipe of the moment. I hope you try it! In a blender, pulse together 1 mango, 7 tomatoes, half of the cucumber, half of the bell pepper, half of the onion, half of the cilantro, the lime juice, garlic, chilies and soy sauce. Completely liquefy and set aside in the fridge to chill. Meanwhile, chop the remaining ingredients in smallish, uneven chunks or however you’d like you soup’s texture to be. Mix the soup and the chopped up vegetables together and enjoy this refreshing zingy concoction! Summer will soon come to you too! Disclaimer: This post includes affiliate links which give me a small cut if you make a purchase. This comes at no cost to you and allows me to continue running this blog! Thanks for your support! hahaha backpacking with a glass blender does sound a little insane… But ya, so good to start the day with filling and nutritious food isn’t it!